Last week the Government published its long awaited Clean Growth Strategy, described by the Telegraph as the coming of age of the green agenda. Clean growth is defined in the document as growing the UK’s national income while cutting greenhouse gas emissions, which are expressed in terms of millions of tonnes of carbon dioxide equivalent. One tonne of carbon dioxide is described as having roughly the same volume as a small house. “Capturing part of the global opportunity while continuing to drive down carbon emissions from our own activities could provide a real national economic boost. “And this is driving a new, technologically innovative, high growth and high value “low carbon” sector of the UK economy. 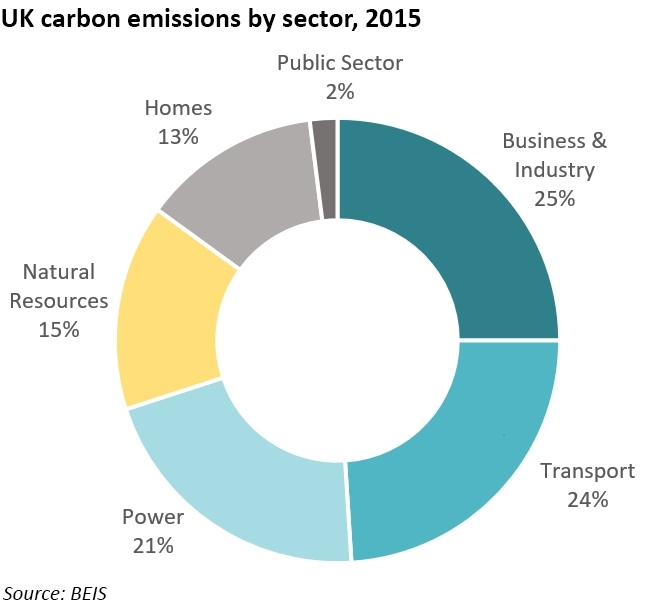 The biggest sectoral contribution to UK emissions comes from business and industry, despite these emissions having halved since 1990, with the reductions coming from improvements in manufacturing processes and better efficiency of non-domestic buildings. The Government says it will put in place a simpler, more ambitious and long-term policy and regulatory framework including simplifying the energy and carbon reporting framework, ensuring that those who lease premises to businesses, improve the performance of their buildings, and that all new commercial and industrial buildings are more energy efficient. An Industrial Energy Efficiency scheme will be created to help large companies cut their energy use. Additional measures will be targeted at energy intensive industries, requiring businesses to switch from fossil fuels to low carbon fuels such as sustainable biomass. The Government believes that beyond 2030 this switching will need to substantially increase in scale and be coupled with technologies such as carbon capture and storage (“CCS”). £162 million is committed to R&D and demonstration of energy, resource and process efficiency alongside better low carbon fuels and CCS. Transport contributes 24% of overall UK emissions, and has only seen a 2% reduction since 1990. While new cars are up to 16% more efficient than they were in 2000, this improvement has been offset by a 9% increase in the number of cars on the road. To meet the Government’s 2050 target, almost every car and van will need to be zero emission by 2050, so the sale of new conventional petrol and diesel cars and vans will be banned by 2040. Emissions from heavy goods vehicles will also need to fall significantly and the Government wants to incentivise cycling and walking for shorter journeys. £1 billion will be spent to boost the uptake of ultra-low emission vehicles (“ULEVs”), and rapid charge points will be installed every 20 miles across 95% of England’s Strategic Road Network. All new charge points will be “smart” enabled to allow load shifting away from peak times. £50 million will be made available for the Plug-in Taxi programme, giving taxi drivers up to £7,500 off the purchase of a new ULEV taxi. The Government has already provided £4.8 million to create a small network of 12 hydrogen refuelling stations, and £2 million to increase uptake of hydrogen fuel cell cars and vans. A new £23 million fund was recently announced to boost the creation of hydrogen infrastructure. Last year the Government announced £100 million for fitting existing and new buses with low emission technologies. Various initiatives are already in place to explore ways of reducing emissions in the HGV segment, and complementing the 2016 Rail Freight Strategy. HGV platooning using advanced vehicle technologies enables lorries to travel in close groups, which are more fuel efficient, will be trialled to assess whether the approach is suitable on UK roads. On domestic shipping, the Government will work with industry to develop new propulsion systems, hull design and aerodynamic structures, and emission reductions will also be targeted at the aviation sector. The Government expects to invest around £841 million out to 2021 in innovation in low carbon transport technology and fuels. At least £70 million over the next five years will be provided for innovation in energy storage, demand side response and other smart energy technologies, including up to £20 million for vehicle-to-grid products and services. £40 million is being set aside to fund the development of low carbon fuels from waste or industrial and agricultural by-products. Power sector emissions account for 21% of UK emissions and have fallen 49% since 1990 as the electricity system has transitioned from thermal power to renewable generation. Last year, 47% of the UK’s electricity came from low carbon sources. The Government anticipates that by 2050 emissions from the power sector could need to be close to zero, and could even be negative if sustainable bio-energy and carbon capture and storage are used together. At the same time, electrification of heating and transport could see demand rise. The Strategy confirms the Government’s intention to phase out unabated coal generation by 2025, and ongoing support for nuclear power. The Sector Deal for offshore wind could result in 10 GW of new capacity in the 2020s, and alternatives for supporting small-scale low carbon generation are also under consideration. Newer technologies such as wave, tidal stream and tidal range, could play a part if they are competitive with alternative forms of generation. 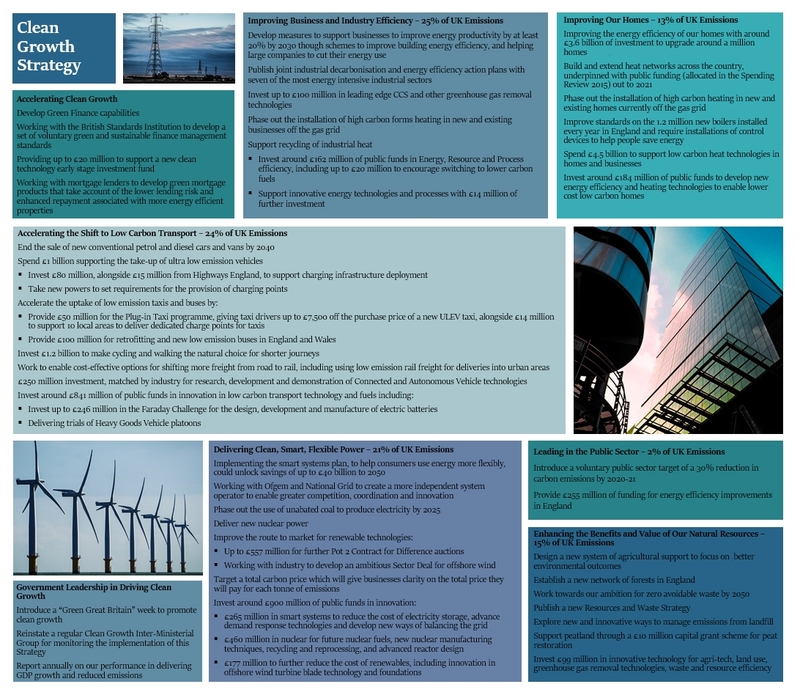 The Smart Systems and Flexibility Plan published in July will enable technologies such as energy storage and demand side response to compete effectively in the energy market. The Government intends to work with Ofgem and National Grid to create a more independent system operator, and will seek ways to ensure significant private investment is made in new electricity interconnectors. The Government expects to invest around £900 million of public funds between 2015 and 2021 in research and innovation in the power sector, including smart systems, electricity storage, demand response and nuclear power. The Government expects to invest around £177 million to further reduce the cost of renewables, including innovation in offshore wind turbine blade technology and foundations, as well as new innovations such as floating offshore wind platforms, and advanced solar PV technologies. The Government remains committed to CCS, with plans to invest up to £100 million including up to £20 million for a CCS demonstration for new technologies and an extra £10 million for the UK’s £60 million international CCS programme, which has been running since 2012, however, this is significantly less than the £1 billion promised in the 2015 Conservative Party election manifesto. The UK’s natural resources – livestock, crops, trees, land use and waste – now contribute 15% of total emissions, down 50% since 1990. During this time emissions from the waste sector have decreased by 73%, driven by taxing waste to landfill, increased recycling and more and better waste infrastructure. Waste helped to generate 14% of the UK’s renewable electricity in 2015. Farms are using more efficient agricultural practices, for example improving crop nutrient and crop health management. Leaving the Common Agricultural Policy and designing a new system of future agricultural support will provide the opportunity to address climate change from agriculture more directly, and the Government plans further initiatives to create new woodlands to provide both carbon reduction and timber, with a target of 12% tree cover by 2060. The Government will introduce a new agri-environment system to support the future of farming and the countryside. There will be initiatives to strengthen farm biosecurity to improve productivity and reduce reliance on veterinary medicines, and to encourage the use of low-emissions fertilisers. Funding from the £200 million package of Rural Development Plan for England Growth Programme and Countryside Productivity Offers, announced in July 2017, could be used to support renewable energy projects, such as solar panels or small wind turbines linked to battery storage. The Government expects to invest £99 million out to 2021 on innovation in natural resources, improving land productivity, increasing soil quality improving agricultural and forestry productivity and resilience. Homes now account for 13% of the UK’s emissions (rising to 22% once electricity use is taken into account) with average household consumption having fallen by over 17% since 1990. The Government has announced a range of measures to generate further reductions, around two main themes: improved energy efficiency measures and encouraging the adoption of cleaner heating systems. The Energy Company Obligation is being extended to upgrade a further one million homes, supported by £3.6 billion of investment, and the Government will consult on how to make legislation requiring minimum efficiency standards for privately rented homes more effective – from April 2018 properties will need to have a minimum rating of EPC Band E before they can be let. The Government would like as many homes as possible to be upgraded to EPC Band C by 2030.
improving EPCs in light of new sources of data and capabilities. Every home is to be offered a smart meter by the end of 2020 and the Government will explore how the data available through the national smart metering platform can, support personalised recommendations for saving energy. Standards for new boilers will also be improved. The Government plans to spend £4.5 billion between 2016 and 2021 on low carbon technologies such as heat pumps, biomass boilers and solar water heaters. The installation of high carbon fossil fuel heating in new and existing off gas grid residential buildings will be phased out during the 2020s, starting with new homes, and £10 million will be invested in an innovation challenge fund for low carbon heating systems. £184 million will be invested out to 2021, in research, development and deployment of innovative energy efficiency and heating technologies, and the gas network. To explore the range of opportunities for the UK out to 2050 the Government has used a model of the whole UK energy and greenhouse gas system to explore different possible outcomes by considering the availability, performance, feasible build rates, and costs of existing and new technologies, as well as how the future economy might differ from today. Electricity: All cars and vans are electric and 80% of buildings use electric heating. Electricity is the main low carbon energy source for industry, making up around one-third of fuel demand, and 20% of buildings use a largely low carbon district heat network. In this pathway CCS is not available, and hydrogen production is low meaning emissions are higher than in the other two pathways. Hydrogen: All cars and vans are fuelled by hydrogen and the majority of buildings using a hydrogen grid. Electricity and district heat still play a role in both residential and commercial/ public buildings. Overall hydrogen production is around 700 TWh in 2050, with Steam Methane Reforming and CCS being the primary generation method. Electricity demand and therefore generation is lower than the other pathways at around 340 TWh (roughly the same as current levels). 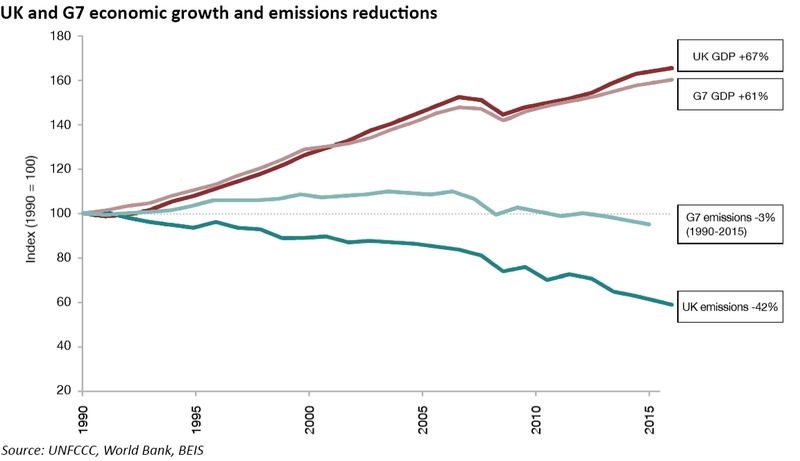 Emissions removal: Negative emissions in the electricity sector create headroom for other sectors such as transport, buildings and agriculture to decarbonise more slowly. Around 80% of cars and vans are electric and 60% of buildings are heated by low carbon electricity. 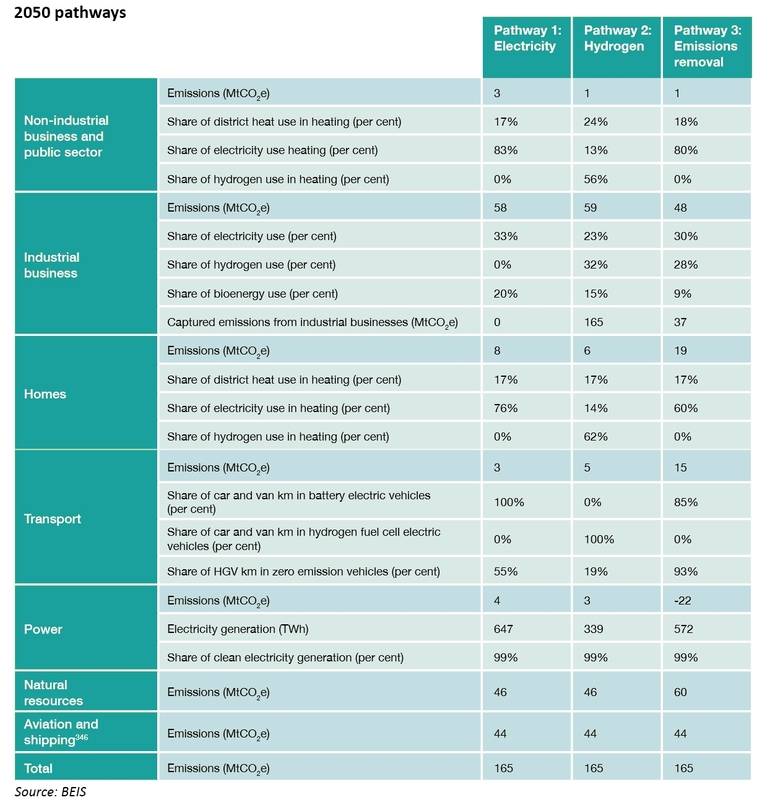 Around 20% of buildings uses a largely low carbon district heat network. All three pathways assume that 99% of electricity generation will be “clean” – more than double today’s contribution from renewable energy – with two of the three pathways showing a significant increase in overall generation from current levels. While the Government says these pathways do not represent either the most likely or most desirable approaches, they give an idea of the scale of the challenge to meet 2050 targets. In little over 30 years, we face a complete re-design of the electricity network alongside either a total transformation of the gas network to hydrogen or a reliance on as yet unproven carbon capture and storage technology. In order to achieve its climate goals, the Government needs a detailed roadmap, and this Strategy fails to deliver that. In fact it’s difficult to understand why there has been so much hype surrounding its publication since in almost every area, the Strategy talks about launching consultations and creating working groups rather than defining concrete steps to delivery. Some important segments such as shale gas are entirely missing, while land use policies have more emphasis than might be expected. Hydrogen also has a higher focus than the current state of play would suggest, but it relies on CCS, and so far there is simply no proven solution to implementing CCS economically. Promoting energy efficiency is sensible, but the low-hanging fruit has already been picked, leaving a significant challenge to improve the country’s aging housing stock. The most realistic of the three pathways discussed in the paper is “Electricity”, and although there is currently no visibility on how to successfully manage a 99% renewable electricity system – it is more plausible that this challenge has a feasible solution over the next 30 years than either the large-scale deployment of CCS or the transition to a hydrogen gas system (which in any case requires CCS to deliver emission reduction goals). In any case, the cost of delivering these solutions will be significant, and there are no guarantees that the necessary technologies will emerge in the required timeframe. The Government may be better off considering how the effects of higher carbon concentrations (which may turn out to be less severe than expected, given the consistent overstatement of warming effects in climate models) could be mitigated, rather than gambling on the emergence of new technologies to solve the emissions “problem”. But whatever approach is taken, the Government will need more than fine words and grand ambitions if progress is to be made towards it targets, and in the meantime, business are left guessing which way the policy choices will go. “Electric cars will need clean power and the UK’s electricity grid is already greening fast – coal power has fallen from 40% to 2% in the last five years. The new plan rightly builds on the UK’s success in dramatically driving down the cost of offshore wind power, yet it all but ignores an even cheaper source – onshore wind. It seems that even the conviction that the green economy is the UK’s future is not enough to face down the rural Tory-voting minority who continue to tilt at windmills. Solar power also seems destined to suffer the same fate. Despite looking these gift horses in the mouth, and ignoring tidal power, the plan promises yet more cash for those with their snouts in the nuclear trough. The hyper-expensive Hinkley Point farce has not dulled the appetite for more new nuclear power and it intends to plough by far the biggest sum of its innovation funding into the one energy technology where costs are always rising. But the biggest worry is the very limited support for carbon capture and storage, the technology that takes emissions from fossil fuels and buries them under the ground. CCS is seen as absolutely vital by the Committee on Climate Change, the National Audit Office and the UN’s climate science panel and the UK’s emptying North Sea fields are perfectly placed carbon reservoirs. But CCS gets only about a quarter of the investment of nuclear and just a tenth of the £1bn promised in the plan so abruptly canned by Osborne in 2015. The de-carbonisation of the electricity system is creating significant challenges in balancing the grid. Without solving these the costs of adding more intermittent generation will grow, and the reliability of the system will fall – the declining costs of renewable technologies are not in themselves sufficient to offset these costs. Electrification of transport will add further strain to the system, so large-scale technologies such as nuclear power are an obvious solution (although the Hinkley Point C project is arguably not the best approach to have taken). Tidal power is certainly not a viable solution, particularly given the likelihood that it would exacerbate the intermittency issues created by wind power. ← The energy price cap is finally on the table but will anyone actually be happy with it? Meanwhile in other news, the house sparrow population has declined as the country has transitioned to smart phones. Burning wood is not a fall in emissions, and neither is the move form coal to natural gas ‘renewable energy’. One expects ones government to lie to the electorate, but this is actually important. That’s right….all the numbers in this post come directly from the Strategy document, to provide the context behind the Government’s position, not because I agree with them or think they indicate what they claim to indicate….